There are 4 reviews of Slow Explosions. Polarizing. The first spray is very strong, lots of alcohol and immediately dies down into saffron and leather. It's a strange combination-the dry mustiness of the saffron pushes against dark leathery notes in a way that is jarring. There is some apple here, lots of medicinal benzoin. It's dark and moderately heavy, powdery with dark floral notes of rose as well. It's well-blended and unique. It defies categories. Is it an Oriental? It doesn't have much sweetness and the saffron isn't traditional: it doesn't have a categorical spiciness, per-se. It has some floral notes but it certainly isn't a traditional Floral scent. It smells like something you would wear at a non-traditional formal gathering. Projection is below average to moderate, longevity is a few hours until a skin scent. Overall, I don't find it a particularly pleasant scent, but it does feel like it's a labor of love that is quite well layered and has complexity: those layers are just a bit too combative with one another for me. Close to a thumbs up but...not quite there. The opening is an abrasive rose with oily leather. The sweetness from the apple is also there but is gone after the opening. The rose note in the beginning and bitter, heaviness of the leather makes it feel like a Montale with the oud-rose combo. Also, the saffron + leather reminds me of Tuscan Leather a little. Has average projection and longevity. This stuff is unusual. It's like going on a trip that starts out bad, but then ends up being amazing and ends too quickly. Slow Explosions is all about Saffron. (Thanks to landshark321's review that suggested watching the youtube video with perfumer and creator of the scent Josh Meyer). Josh explains that he found a specific Saffron that he had worked with when he created An Air of Despair, and wanted to continue on with the next phase of his exploration of saffron, and it ended up being Slow Explosions. So, as I alluded to above, I'm not fond of the synthetic apple opening with this frag. It smells like an apple wine, but with synthetic edges. This part of the wear was not enjoyable for me, and was one of the reasons I wanted to wear it two days in a row to see if I was just being unreasonable the first day, but no...I don't like the opening. The good thing is, it gets much better from there. The mid notes still have some of the clingy apple booze going on, but the real show stopper is the end of the mid to the base notes. This phase is enchanting. The funny thing is, when I put my nose close to my wrist, I could still smell the apple, and a moth ball type vibe, but when I caught a whiff of it from further away, such as when the air conditioning in the building caught a vagrant waft of this and pushed it towards me in the air, the scent was truly magical. It is an addictive type waft. :-) I would consider purchasing the travel spray, as I think that would be enough of this fragrance to last me for quite some time. One thing I've learned from this one is just how important the opening of a fragrance is to me. I would rate this one higher if the longevity was better, because I could then enjoy the truly special part of this frag for a longer period of time. I'd definitely try a sample before purchasing this one. It is truly unique. 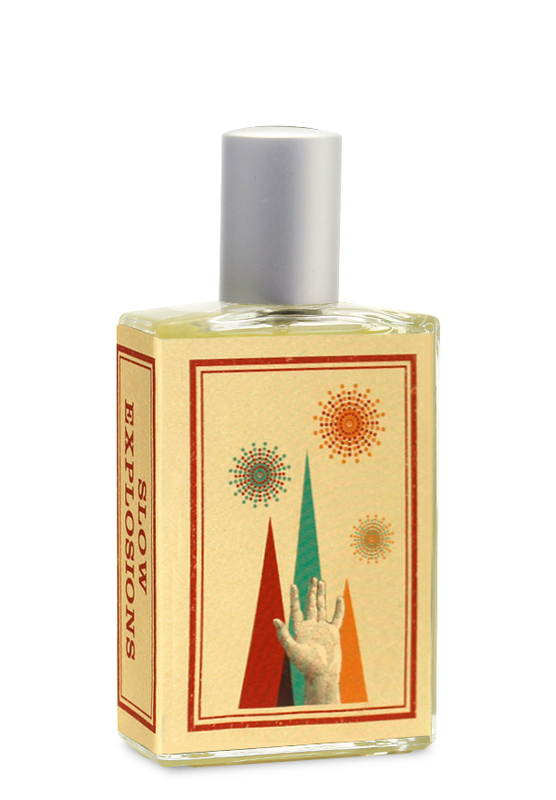 Imaginary Authors Slow Explosions is a continuation of the story begun by An Air of Despair, a saffron bomb limited edition summer fragrance launched in 2015. Slow Explosions features the same signature note of saffron and adds another signature note, one I've longed to see used in this house, of rose. However, apart from the saffron and rose stars there are a handful of other supporting notes that stand out on their own and contribute to a rather unique mix. Specifically, apple comes out a lot on my skin, and the perfumer speaks to this specifically in an interview. I also get a little leather and benzoin. So the mix overall is unusual but pleasantly-blended, an unexpected treat coming mainly from the versatility of the saffron. Performance is good,not as much of a beast as Cape Heartache, Memoirs of a Trespasser, or A City on Fire but still good for an EDP. I recommend watching the YouTube video on Looking Feeling Smelling Great with the perfumer, Josh Meyer, for more insight. Not the very best of the house (my favorites are still Cape Heartache and Every Storm a Serenade) but this is perhaps his most unique and surely one I'll be buying a full bottle of at some point. There are no member images of Slow Explosions yet. Why not be the first?